Good morning, chic readers! ‘Tis the season for… spring cleaning, of course! It may not technically be spring yet, but, we don’t know about you, but we like to be ready when spring is ready to make its arrival, as if tossing old shoes and organizing our sock drawers can usher it in a little faster. Plus, once spring arrives, who wants to be cooped up inside cleaning? Not us! If you’re like us, the kitchen is not only the heart of the home. It’s also the place where everything seems to get dumped throughout the day! Sometimes it feels like the electronics are taking over! Docking Drawer charging and powering outlets in the kitchen are probably the most brilliant invention since the smart phone. Now we can charge all those devices without having an ounce of counter clutter. We all know there’s never enough drawer space. There just isn’t. Fortunately, there are so many pretty ways to display all the attractive and practical things that live in the kitchen. If the kitchen is the winner of where everything gets dumped, the office is a very close runner up. Fortunately, there’s a Docking Drawer for the office too. It’s great for smaller electronics but also perfect for putting your laptop in the drawer for the night. For us, it’s out of sight out of mind… and if it isn’t out of sight then we’re on it! Or a smaller nook to work with, there’s plenty of space for a Docking Drawer! Now that the cords and counter clutter problems are solved, there’s plenty of room for dreaming. Coffee in the bathroom, anyone? This morning kitchen is too beautiful for words–and how great to have that first cup without even walking to the kitchen? We don’t know about you, but, for us, stacks of white, neatly folded towels are one of the simplest ways to add instant clutter-free appeal to the bathroom. 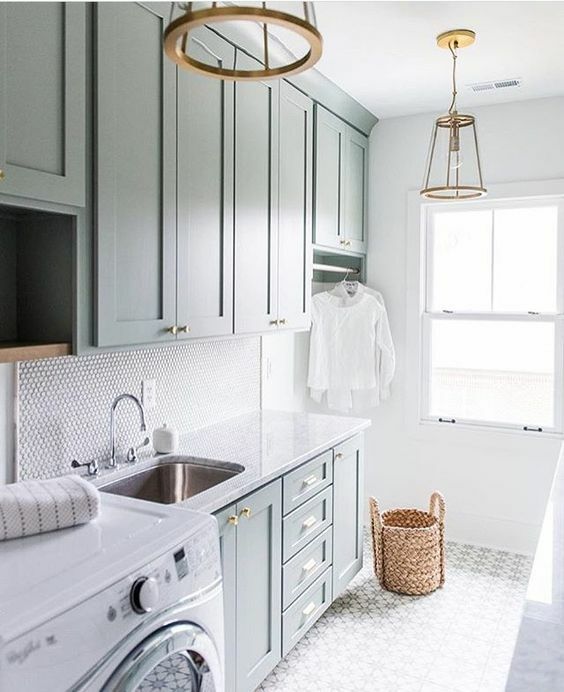 If you’re lucky to have space for a big laundry room, you’re lucky enough. Making the best possible use of the space by hiding everything behind beautiful cabinetry is a bonus! And, of course, we’re spring cleaning our closets. They are our spring cleaning Everest… Packing for the five week The Secret to Southern Charm tour was a good start because it got me in the paring mood. (If you aren’t going to wear it in five weeks when are you really going to wear it?) What’s first on your spring cleaning list? Good morning, friends! Summer in our houses has officially begun–and that can only mean one thing: time for summer vacation! But before we head off on ours, there’s nothing like coming home to a sparklingly clean house. We’re loving these stunning inspiration photos for getting the kitchen all spruced and organized. Aren’t they fabulous? Wishing you all a wonderful day! If you are looking for a great deal, Barnes and Noble has Slightly South of Simple for Buy 2 Get the 3rd Free! Get one for yourself and one for a friend and then another favorite book! Things We Love: An Organized Kitchen! Oh, yes. We had to start sometime, didn’t we? With the organization posts? Because what is 2017 if not the perfect year to create a home that you absolutely love? For us, that love starts with our cabinets. Every year. Well, not every year. Some years it’s our drawers. Or the pantry. But you get the idea. This year, for me, it was the vitamin cabinet. Because I have every vitamin or supplement known to man. I’m just not great at following through with taking the entire bottle… But I’m better than my husband. Literally every new year he buys a 30-day supply of a swanky men’s multi at Whole Foods. And, every year, I chunk the expired bottle–with about 27 pills left in it. So now that’s done. Shew. At our house, this year, the number was three. Three big, black contractor bags full of things that had to be thrown out and taken to the street. Nothing will make you vow to buy less stuff than seeing three bags of it on your sidewalk for 48 entire hours because you forgot that there was no trash pick up on Monday since it’s was NYD observed. After the vitamin cabinet, it was the pantry. This is little Will’s favorite area to help with, so that’s kind of nice. He gets sidetracked pretty quickly by some old fruit snacks or something that he’s begging me to let him eat, but, until then, he’s really good at helping me line up all the glass jars just so. They all match, and it is my favorite thing to peek inside that perfectly organized pantry and see all of those clean, lined up glass jars. Sometimes I walk in there and look at them when I’m stressed. True story. We actually use all of our spices, marinades etc. By “we” I, of course, mean my husband. I get on a cooking kick around January 3 and by about January 5 I’ve remembered how much I hate to cook and the job is turned over to him again. In fairness, he loves it. And if we have mustard, pickles and some nearly expired cumin in the house he somehow turns it into a magically delicious meal. Which is good because, incongruously, though I don’t do the cooking, I do the grocery shopping. I love it because when I get home I get to spend time in my glorious pantry putting all the food away. Since I’m not the cook, it would follow that the knives aren’t really my deal either. We didn’t even have to register for them because hubby had ALL the knives. We keep ours in a block way back on the counter away from little hands. You know, just in case. This would be a major hazard in our house, but it looks fabulous! Dishes and serve ware are another area in which we pared down as much as possible this year. You can just only eat and serve off of so many things, even if, like us, you’re a big fan of having parties. Once you become acquainted with the things you use over and over again–and, more importantly, the things you don’t–this is an easier task. Still hard, because, you know, everything is suddenly full of memories. But easier when your cabinets look all streamlined and clean and nothing is flying out at you when you open the door. Now this is pot storage. We love this and want it immediately. Still on my list (and in my Joss & Main cart): getting those pull out sliders for all of my cabinets. It is amazing how things just get lost forever in the back of those deep cabinets. Sliders make them so, so functional. I can’t wait to get mine! Do you go on a decluttering binge at the beginning of the new year? Or are you one of those people who is so disciplined you don’t even have any clutter? If you’re the latter, we are so jealous. Share your secrets with us! If you could use a little organization in your life tell us: where are you starting this year? Thanks so much for stopping by today! We always love seeing you!